One of the great pleasures of living in the San Francisco Bay area is discovering unique little experiences. 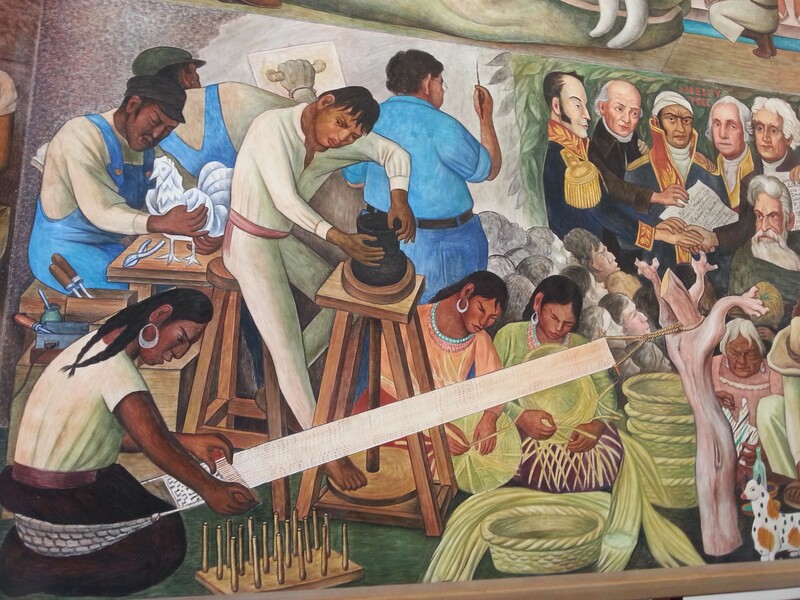 Such is the case with the murals –frescoes, really–of the passionate and controversial Mexican painter, Diego Rivera. You may know him as the guy who married Frida Kahlo. But he was so much more. Originally a cubist, he began attracting major attention when he shifted to post-Impressionism and he’s been called one of the leading artists of the last century. He was a socialist and his work was, shall we say, a bit controversial. San Francisco is home to three of the artist’s huge frescoes, and one — Pan American Unity–is at City College of San Francisco. I had the pleasure of spending some time with it, guided by a man who is passionate about Rivera and an accidental scholar of the painter and his work. His name is William Maynez and Will was kind enough to share some anecdotes for this post. You’ll see them inserted along the way. This particular fresco (sometimes called a mural) was painted on Treasure Island in 10 sections, from June 1940 to November 1940, for the San Francisco Golden Gate international exhibition. 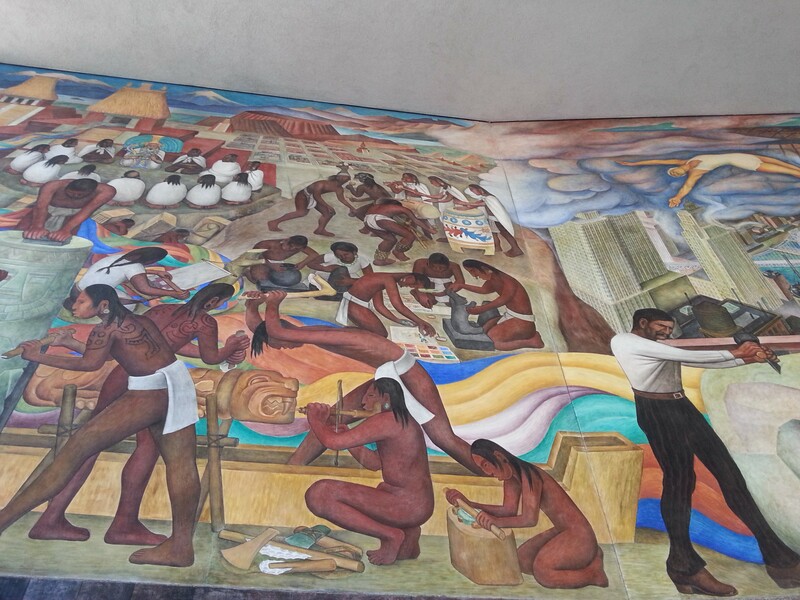 From Will: Upon arriving at the Golden Gate International Exposition, Rivera decided to increase the size of the mural. Our mural is 166% of the size for which he had contracted. He then contracted to come back to SF to triple the size of the existing mural. Alas, WWII segued into the Cold War and he never returned. I believe in order to make a real American art … (one must have) blending of the art of the Indian, the Mexican, the Eskimo, with the kind of urge which makes the machine, the invention in the material side of life, which is also the artistic urge–the same urge primarily but in a different form of expression. So, the mural is a panorama of the Bay Area –and so much more. He references the tyranny of the World War II Axis, his life and loves, industrialism–it’s a mishmash of disconnected scenes that make for a fascinating afternoon of viewing: identifying the characters, the scenes and speculating as to the meaning. It’s 22 feet tall and 75 feet wide, and was originally supposed to be three times this size. This is as I was shooting up, you really can’t tell how huge it is. But take my word for it, it’s huge. I can’t believe he wanted to make it even bigger. Comment from Will: It’s almost like the fresco medium has to choose you. You have to be supremely confident because the plaster is drying and mistakes are hard to hide. Diego often worked 18 hour stints. Imagine a 300 pound man with small hands high up on a scaffold. How did Rivera plan this huge an undertaking? 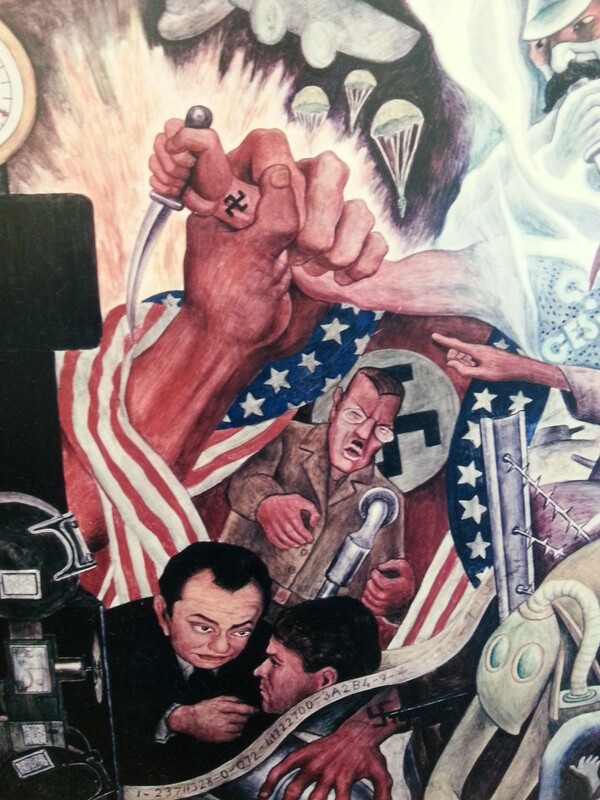 From Will: Prior to coming to SF in June 1940: Since he was in hiding in Mexico City after a botched attempt on Trotsky’s life by Siqueiros and others put Rivera in danger as well, he had no chance to prepare and our mural is an extemporaneous on-site invention. Diego was quite a roue. He had a thing for actress Paulette Goddard, seen above holding his hand in the fresco. Yes, Frida is on his other side, completing the love triangle. George Gershwin introduced Diego and Paulette and she is mistakenly said to be the reason for Diego’s divorce from Frida. Will says that’s not true, that Frida and Diego were divorced before she entered the picture. (What a small world it was, after all!) Paulette is depicted four times in this huge piece. From Will: Paulette Goddard, Charlie Chaplin’s estranged wife, radically changed Diego’s life in the short period she was in the picture. I can document at least two “bridges” he burned in the mistaken notion there was more happening than a flirtation. 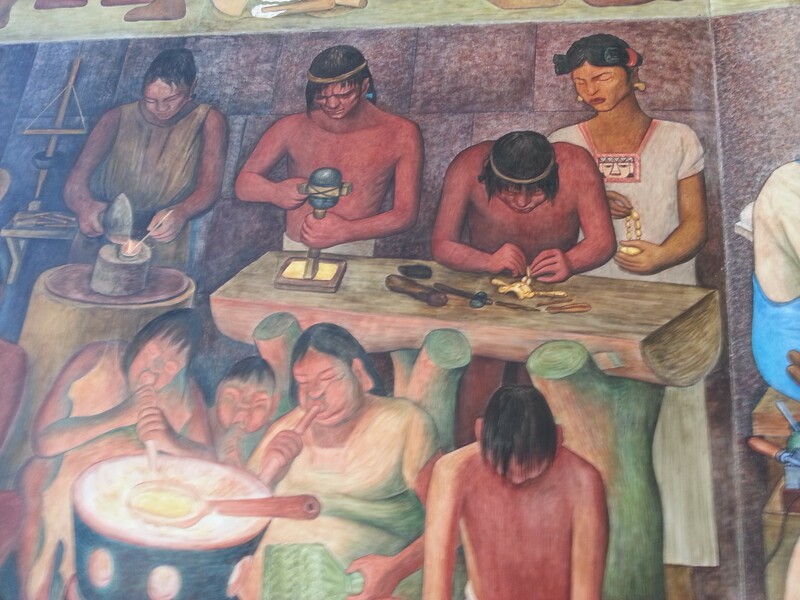 The historical and anecdotal color Will provided on our visit to the mural made the wall come alive for us. It transported me back to a different time, a different world, with characters who were unique. If you are in the Bay area, check out Will’s tours at City College of San Francisco. No fee, just donations. You won’t be disappointed. What a true hidden gem! It’s absolutely gorgeous! This is both beautiful and fascinating – what a feat! I might be in SFO in August – and this is a must-see! Sandy recently posted…The Walmart Beauty Box – for Spring! You must visit this place! I want more! I’m always sad when I get to the end of your posts… . 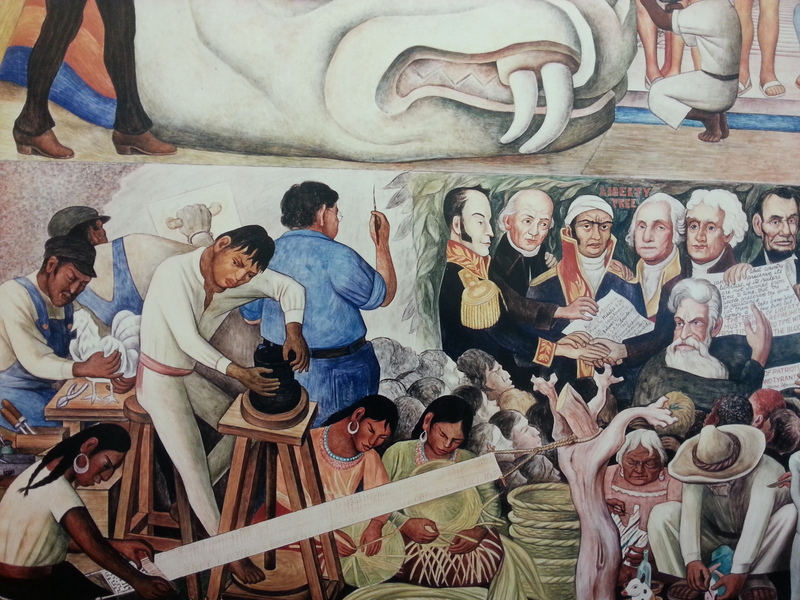 Bookmarking this for my next trip to SF because Diego Rivera is in my top ten. What a wonderful compliment, Mithra! 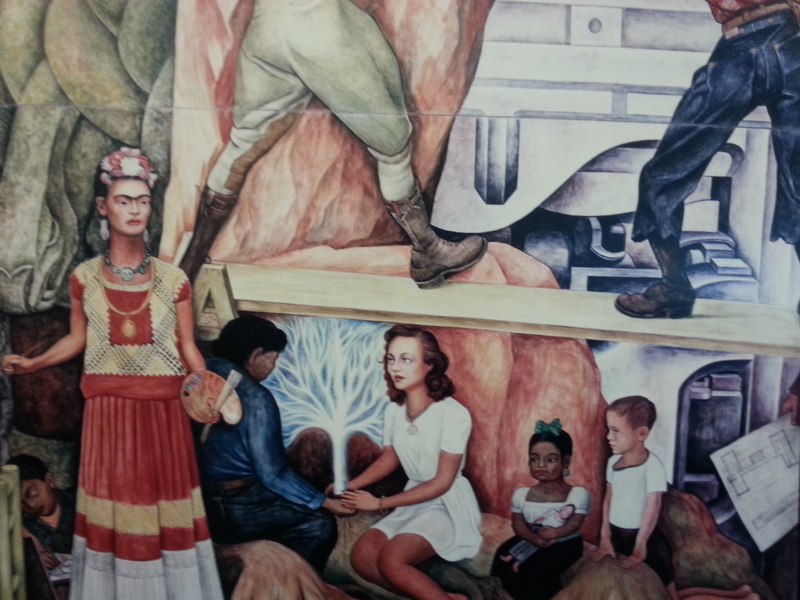 I’ve always admired Diego Rivera and I know his general story with Frida (after seeing the movie.) But I didn’t know about Paulette Goddard who, since I love old movies, was as adorable in personality as she was on looks. I’m not surprised he fell for her. How fascinating to know about this relationship! Also I spot Edward G. Robinson in the bottom photo. I assume it’s some kind of reference because he was Jewish and active in Jewish causes, with all of the Nazi references. Great post, Carol. Yes, I forget the movie that particular part of the mural references. He was the star. It really was a fascinating afternoon. I had no idea that was there, and I was an Art Major at UC Davis. Thank you so much for a wonderful post letting us all know! It will be on my list the next time I’m in the city — and I can’t wait! Wow how absolutely beautiful! Very interesting, I love learning about artists I’ve never heard of before! Love his murals! Thanks for sharing them and his story. Thank you for sharing more of your beautiful city with us! I really want to experience this in person I imagine it to be stunning! Zena’s Suitcase recently posted…The New Thomas Land Expansion Is Now Open! This is such an interesting story of a fascinating man! I love, also, how you broke down the different sections of the fresco. Thank you for this wonderful art history lesson! wow is that a powerful mural!I wish I could see the entire masterpiece! thanks for sharing this with us – I would have never known about it if you hadn’t. Love his backstory too! I have visited San Francisco. But I didn’t see those murals. I am sorry that I missed them. He is such an amazing artist, thank you for sharing this. As usual you weave a riveting tale of art and a time gone by. This gives new meaning to his paintings! I love murals because they express so much of just about every emotion! Absolutely gorgeous! I want to go see this.. we live here too! I am always so amazed by anyone who can paint people. I love these murals so much because he was so multi-culture in all the different people choices! These are amazing and look at the amount of detail on a large scale, wow!